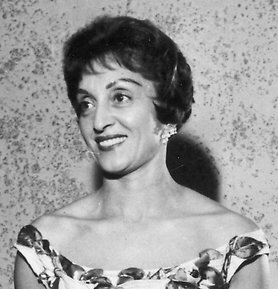 Toni Clark became emblematic of the glamour years of the early Las Vegas resorts with her attention to high fashion and her management of events for the wives of high rollers. In 1944, she came to Las Vegas with her husband Wilbur Clark who opened the Desert Inn Hotel and Casino in 1950. Over the years, Toni Clark became a fixture in Las Vegas society and an avid promoter of the Desert Inn specifically and Las Vegas in general. Toni Clark was born Lena Gaglionese to Italian immigrant parents in 1915. Her father worked as a street cleaner in Seattle and she grew up surrounded by family. A reluctant student, she quit high school after three years. In 1941, Toni visited a friend in San Diego and decided to stay. She moved into the Barbara Worth hotel where Wilbur Clark ran a small club and his father operated the hotel. Wilbur Clark’s father suggested that Toni apply for a job at the restaurant and bar his son was opening, the Monte Carlo. She applied and was hired as a hostess. She began dating Wilbur Clark shortly thereafter and he gave her the name of Toni. In 1944, Wilbur and Toni married in Reno. Soon after, Wilbur Clark purchased the El Rancho on the Las Vegas Strip and the newlyweds left San Diego for Las Vegas. Wilbur Clark owned several Las Vegas clubs, including the Monte Carlo downtown and the Player’s Club on the Strip. In 1950, he fulfilled a dream by completing the construction of the Desert Inn Hotel and Casino with his partners including Moe Dalitz. It was just the fifth major resort on the Strip. Toni Clark did not work in the business side of the resort, but focused on the social aspects of the resort. She planned parties, entertained important guests, and hosted fashion shows at the hotel. After Wilbur Clark died in 1965, Toni remained a prominent member of Las Vegas society. She eventually married her long-time companion, Larry Finuf and together they worked to promote important causes of the city and hosted a number of charitable fundraisers. Toni Clark continued to live in Las Vegas until her death in 2006. Source: Toni Clark, “An Interview with Toni Clark,” an interview by Joanne L. Goodwin [transcript], Las Vegas Women Oral History Project (1995), Special Collections, Library, University of Nevada, Las Vegas.